Discussion in 'Transformers Conventions and Get Togethers' started by Sol Fury, Oct 21, 2017. I love Kei Zama! She’s probably my favourite transformers artist of all time! Dranoel Be the strongest of the strong! Have you seen her injector sketch? She’ll make anything terrifying. I thought I'd post a round-up of the news since the announcement of Kei so here's the announcements and the links. On all days we shall be using both the main hall and the Pavilion Suite, to host some of our panels - the Pavilion suite is a large panel room positioned on the ground floor, next to the hotel swimming pool. Please check the final event schedule for exact details. We are pleased to announce the release of our information and visual guide for attendees, parents and carers which has been designed to help familiarise attendees with what to expect whilst visiting the event. We are grateful to crew member Sarah for all of her help with this pack. With just over two months until TFNation 2018, many fans are thinking about purchases, preparing budgets, and hatching toy hunting plans at the show. Due to popular demand, the trader hall has expanded this year compared to the 2017 event, so a tour of the venue and a look at the traders confirmed for the show so far is in order. Join us below! Bens Collectables - One of YouTube’s most popular Transformers - and 3rd party - reviewers will be selling his wares at a show for the first time. Gundam Mad - Returning after a year’s break are TFNation attendees’ favourite Gundam and Gunpla stockist (all robots are robots after all). Science Fiction Collectables - Making their TFNation debut, Science Fiction Collectables offers a wide variety of products and lines for you to purchase, beyond the transforming robot toy selection. T4E - The "Total Wipeout" appearing T4E make a welcome return to the convention scene after several years of hiatus. If the name of the game is Transformers and Transformers alone, head straight for the stalls belonging to Combiner Stores, Beyond Technologies, along with national hotspots ID Toys, Kapow Toys, Nottingham Robot Company, and The Spacebridge. Plus, directly from the US, Tempting Toys and Collectables is bound to tingle your taste buds with something spicy. For those looking for something that moves laterally into pop culture / sci-fi toys and collectables, but is not necessarily of the – official or unofficial – Cybertronian shape, look no further than the likes of Creations of Curiosity, Max and Me Love Toys, and our very own TFNation Merchandise stall, for all your repping needs. For comics fans, who need to stock up on back issues from IDW, Dreamwave, Marvel and more, Comic Connections will be the go-to area, along with their official and Third-Party products. And, last so far but not least, non-profit traders ToyFu will return to collecting money for charity over the weekend. If you haven’t encountered their selection of well-loved stock, get ready for some hidden, grail-y treasures. We look forward to welcoming all the traders, including those yet to confirm their presence, to TFNation 2018 and wish them the very best for the show. With such a wide, varied range of items on offer, TFNation 2018 is sure to add to your collection. If you want to ensure all communications are intercepted, join our mailing list at https://tfnation.com, including even more traders. Last week, we introduced you to the first 16 traders attending TFNation 2018. We are now pleased to confirm that newcomer Galactic Toys will also be joining us for their first TFNation. The addition of Galactic Toys (http://www.galactictoysuk.com/ ensures the widest range of different items available at any TFNation so far. If you are a fan of FUNKOPOP, boardgames, or are simply looking for something different than your usual purchases, then you will certainly want to look at the wide selection they will have on offer at the event. Galactic Toys are the latest, but by no means the least nor the last, trader to be added to our ever-expanding trader hall. Joining Galactic Toys, and returning for their third TFNation are Phantasmic Toys., a long time UK Transformers convention trader. They will once again be bringing a wide variety of figures including Power Rangers and Super Sentai Series (a brand now fully owned by Hasbro, to morph your money into plastic joy. The TFNation display area has become one of the highlights of the show for many attendees. In 2016, we showcased a complete collection of Rock Lords, the entire Beast Wars and Beast Machines lines (including the Japanese subseries for II and Neo), and various upcoming 3rd Party and Official toy releases. In 2017, we introduced the world of TFNation to Takara's Brave series, a stunning display of figures many had not seen before. This year we are looking to do something a little different, smething perhaps more creative: we want Your toys! Not just any toy, however - we want your customised and kit-bashed figures. Whether you have simply touched up a figure by adding some extra details, part-swapped with other toys or made it yourself from scratch, we want to showcase it to the world of TFNation and beyond (through the inevitable social media interactions). Remember, this isn't a competition, it's a display. You will find our new Custom Figure Application Form asking you to let us know that you are interested, as well we telling us more about the item(s). Figures will be displayed in a locked glass cabinet for the duration of the event. Applications are open to both weekend and single day attendees. Space is limited by the physical cabinets, but we want to create the largest showcase of customised Transformers figures that the world has seen. The figures could be new ones you are working on, past entries to competitions at other shows, or those you created years ago. We want to encourage creativity in the fandom, so it doesn't matter if you are a regular kitbasher or not. There are no winners or losers, just a shared appreciation for your creativity. And depending on the interest and success of the display, we may look into Custom Competitions at future events. Space in the contest is limited so all applications are subject to approval prior to the event. Completing the application formdoes not mean that your application has been approved. TFNation crew will approve applicants until all spaces have been filled. Pre-judging is presently scheduled to take place at 5:00pm in the Kings Suite (Club Con), before the room opens to attendees at 6 m. Please note: these timings are subject to our final schedule of events and therefore may change - don't worry, we will make an announcement if necessary. With so many fans making TFNation 2018 their first Transformers convention experience, who better to cover the basics than Chris McFeely, TFWiki scribe and all-round knowledgeable gent. Chris runs through not only covers ticket and accommodation booking, but also the guest line-up, an overview of the schedule and a few extra titbits! Please share with fellow fans and make sure you subscribe to Chris for more of his BASICS vids on aspects of the TF Lore! We are very pleased to announce THE FORGE has been expanded for TFNation 2018, in order to showcase even more talented people from the creative side of the Transformers fan community. To find out more about those attending, take a look below, and make sure to stop by to browse, peruse, purchase, or just say hi! Also known as Umi Miyao, Coralus has been drawing robots for years specifically for Transformers and is now working under third party companies as a comic artist. She is also currently creating an original Transformers comic that is going to be presented at her table, along with other adorable fun stuffs, such as the famous Kittyformers and chibi versions of Transformers. Lem & Chaozrael - two German artists shared table bringing you a broad variety of merch you simply need in your lives! Chaozrael is best known for their cosplay works and will provide you with props, helmets, masks, some print media and a cosplay book. Mixed media comic artist and Robot-Couture fashion designer, Lem brings her second generation of 'Ener-johnnies' apparel and accessories line, but also original paintings for you to choose from. In case of rumors of these two being somewhat involved into any bounty hunting activity (tm) or shady Cybertronian businesses - don't believe a single word! Zee is a fan artist with a penchant for all things robot and the Transformers Animated style in particular. She is eternally salty that Hasbro has never produced any TFA Perceptor merchandise and will be selling some herself. Products offered will include stickers and post cards, as well as a few soft items featuring Transformers Animated fan art. Amature Doodler Scribbler and Splatterer of lines on paper! Drawing a bit of everything, constantly improving my style and techniques. Come by my table for prints and sketches old & new, plus Khaosenvy Anthology issue 1! See you all there! Beth (Andernell) is a UK Illustrator and aspiring comic artist from the rainy coast of Suffolk, currently freelancing and working on personal projects, as well as colourist for the Transformers original comic ‘Tales of Crystal City’ by artist Coralus & writer Peri. Sharing a table this year with Cara (Themanlylobster), an illustrator from London who cannot be stopped when it comes to drawing long necked noodly armed TFs. Avid transformers fans and lover of all robots who are excited to bring a variety of pins, prints, stickers, charms, and other merchandise inspired by the many Transformer continuities. Hailing from Scotland, Zero has been freelancing for the last two years, covering a wide range of traditional and digital commissions and fan works, with a wealth of influences and styles. He'll have a selection of prints and trading cards available as well as work featured in Toy-Fu's Masterforce zine, The Refined Robot Co. zine, and will also be contributing to TFNation's 2018 creative output. If you like heavy details, loud colours and some obscure characters, be sure to stop by his table. I’m Nathan Webb, a freelance illustrator. I write the Trivia and produce art for Space Ape’s Earth Wars live stream on Thursday nights. I’ve also got a comic strip in this years Toy-Fu charity comic. But the biggest thing I’ve done recently is self publish issue 1 of Britformers (hopefully printed in time for TFNation). Eph is an illustrator who stumbled into the Transformers fandom some time ago and decided it's an awesome place to be in. She enjoys drawing the robots we know and love in many, many bright colors and with a semi-realistic style. She has contributed to many fan-run projects and hopes to continue doing so in the future. Shibara is a board-game enthusiast, sci-fi lover, passionate aquarist, and fine-arts student. She has been working in freelance illustration for the past decade, with a strong focus on all things Transformers since joining the fandom in 2012. She’s been developing several personal and group projects within it, and hopes to continue doing so for years to come. Like most artists, Loosescrews is always learning. Like most creative freaks, is socially inept and pretty reclusive, but thanks to this lovely combination, this artist has made and met some fantastic friends online within the Transformers community, and has never felt more inspired and driven. Currently studying animation at university. Booyah! Nate is a Welsh artist who resides by the sea in sunny Devon. Now attending his third TFNation (his second in the forge) Nate is looking forward to seeing you all and trying to get you to buy a print of Daniel Witwicky! Crono of Lullishop will be selling her crafts at TFNation 2018 including necklaces and badges / magnets of characters from the IDW Transformers series, Beast Wars, Transformers Animated, Prime, Rescue Bots and the 2015 RiD animated series. You can check out her work at her Storenvy (http://cronosiem.storenvy.com/), Tumblr account (http://lullishop.tumblr.com/) and can find her on Twitter @cronosiem. Hinomars19, anime and manga art man! For Transformers I mostly do Fan art and am currently writing a fanfic light novel (which will hopefully be available at TFN!) and toy customs. I'm also one of those naughty scoundrels who does comic art and packaging art for 3rd party toys! Spank me! I'm currently knee deep in my own original manga. A fan artist and convention-goer from Scotland, dabbling in anything that plays to my interest, such ase Transformers, Cardfight Vanguard, Yu-Gi-Oh and various other works of fiction. Previous work has been for Varg Veum (2014), as well as previous convention work for Auto Assembly. Vanessa will be selling prints, key-rings, and mugs! A Russian and a Swiss artists brought together by The Power Of Love... for Transformers! Making their return to The Forge after amazing last year, once again with many fresh prints, stickers, badges and more. They will not do any art commissions on the spot but check out their blogs for pre-show ones! Lauren will be selling a range of unique products from art prints and tote bags to charms and embroidery patches! I am a 3D sculptor and print illustrator, and I've been working on various sculpts of some of my favourite Transformers characters. I use z brush and I hope to 3D print in resin in large/medium scale statues. These are more for display on the day, unless someone takes an interest in buying one or commissioning me - I really just want to showcase my skills as a sculptor and the kind of packages I've used to create them as home 3D printing becomes more and more exciting and accessible. I also use these 3D Transformers sculpts to create detailed illustrative work for print and I'm hoping on the day to have a few of these prints for sale. Hi, I’m Mat, I’ve been a tattooist for nearly 20 years. Over the past few years I’ve decided to branch out with my artwork and started making prints, books, stickers etc. In my own graffiti based cartoon style. I love anything geeky, movies, cartoons, games, comics, toys. Also growing up in the 80’s transformers was one of my top favourite things, which makes tabling at TFN, the first convention I’ve worked, even more awesome. Hope you like what I bring? Lyrica is a Freelance artist, mostly known for her cartoon work and background in Animation. Her work features mostly Transformers Animated, including comics, animations, and illustrations. I will be selling homemade embroidered patches, and I also plan to have acrylic charms and stickers. Flags - Standard size can be flown outside, and smaller ones for decorating your walls. Lasered Goods - We have both a fiber laser, and a carbon one. We'll bring mostly the light up LED based things, and Wooden etched robots. Likely we'll have Dogtags and Coins as well. Wall Scrolls, Safe For Work Dakimakura, Mousepads, Charms, Keychains, and Novelty Currency are all within our capabilities and will be made to order as convention season draws near. The folks from Transmasters UK (or TMUK for short) will be back in The Forge again this year with a dizzying array of fanzines, art and other exciting items! Behind the table will be Gav Spence (you'll be familiar with his work from last year's Trial and Error Graphic Novel), Ben Pirrie (who has provided art for the last two TFNation Convention Programmes), and, making his first appearance at TFNation, Garry Bodsworth, a veteran of the TF convention and fanzine scene in the UK. They'll be assisted by TFN crew members Andy Turnbull and Ed Pirrie when their busy schedules permit. What will you find at the table? A whole host of prints, sketchcards, postcards, fanzines and fancomics written and illustrated by not only this fearsome fivesome but a whole host of other talented TMUK members. And if you ask nicely the boys will be more than happy to do a few one-off sketches and commissions. Best of all, it's all for a good cause: the money you hand over at the table will be going to charity organisation Mary's Meals, just like our colleagues at Toy-Fu. So we hope to see as many of you as possible over the weekend! 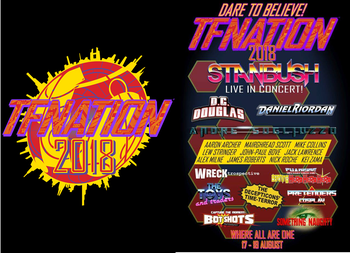 TFNation 2018 starts with "Fan Friday", in which we offer YOU, the Transformers community, the chance to conduct an officially supported panel before the main programming begins. Maybe you are one of the faces/voices/hands of the Transformers YouTube community, or perhaps you are part of a podcast crew, bringing Transformers information to the airways, or part of an online collector community (website, Facebook, or otherwise) or you just have an interesting story to tell. Whatever the reason, head over to https://tfnation.com/2018/friday-fan-panels, where you can apply for a TFNation panel slot. Do note that TFNation is a family-friendly event, and the content of all panels must reflect this. Our venue's panel room can hold several hundred people and our AV team will be on site to help you set up and adjust issues during your time. 'Fan Friday' gives you a chance to speak to your followers face to face, as well as reach a new, attentive audience who have come together from around the globe to talk all things Transformers. A limited number of slots is available, so make sure you apply as early as possible! We are pleased to confirm that pre-orders for TFNation 2018 exclusive merchandise are now open! Our crew will only be stocking limited quantities of these products for general sale at the convention - so we encourage you to pre-order today to ensure you don't miss out! 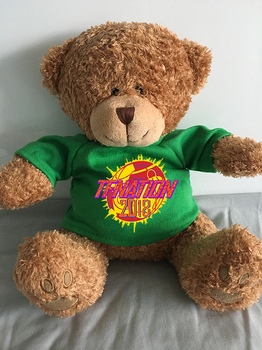 You're going to TFNation and we are sure you'll have a great time this year and will take back many wonderful memories with you, and with the 2018 Tour t-shirt, you can also take back something a little more tangible. This stylish black tee comes with the 2018 logo variant on the front, and a concert billing style rundown of guests and events on the rear. Dare to believe you can look fabulous! Saturday night's all right for experiencing Stan Bush live at TFNation and what would a concert be without a souvenir t-shirt? Featuring artwork by Ed Pirrie, available on a black, yellow or grey tee. You're a winner. So let the rest of the world know that when things get too tough, you got the touch. A touch of style that is featuring art by Ed Pirrie these posters are available in glossy A3 (£10), A2 (£15) or A1 (£25) sizes. Don’t worry, those pesky ‘Cons haven't pulled a last-minute switch of the dates for TFNation 2018 -- it’s the title of this year’s TFNation exclusive! Attentive readers will have noted we said ‘exclusive’ and not ‘exclusive comic’. Well, we think each TFNation should always be a little special in its own way, so we don’t want to fall into a routine. But don’t worry! You’ll still have some quality reading on your hands as we pay tribute to the fine purveyors of Transformers fiction that were the Ladybird Books, as written by John Grant. The Ladybird books loosely followed the toy-range in the UK for ten books (plus an adaptation of Transformers The Movie) and sadly stopped covering the early adventures up to Powermaster Optimus Prime. We never got to see what they would have made of Pretenders, Action Masters, or even Generation Two... until now! Yes indeed. This year you will get a chance to experience what could have been if we’d had a Ladybird book published during the height of Generation Two. And who is bringing you this titanic tale of temporal trickery? The writing duties have been entrusted to Matt Marshall and Ralph Burns. Though of course, it couldn’t be a Ladybird style book without some lovely art to go with it. Old friends from last year’s comic Trial and Error – Herzspalter, Chris McFeely, Ed Pirrie, Gavin Spence, and Andy Turnbull – are back, and they've brought friends: Garry Bodsworth, Kris Carter, Coralus, Matt Dallas, Andrew Kiernan, Sora L Pereira, Chris Phillips, Ben Pirrie, Liam Shalloo, Shibara, Kris Smith, Vanessa Sutherland, Aelx (Eph) Tarca) Joe Teanby, and Adam (Zerokaiser) Worden, have all provided gorgeous illustrations. As for the cover, the art is by TFNation 2018 guest Mike Collins (ably assisted by Kris Carter on colours). As some of you might remember, Mike provided the art for the first four Ladybird Transformers books back in the day. How can you make sure you get a copy, you ask, and how much will you need to pay? 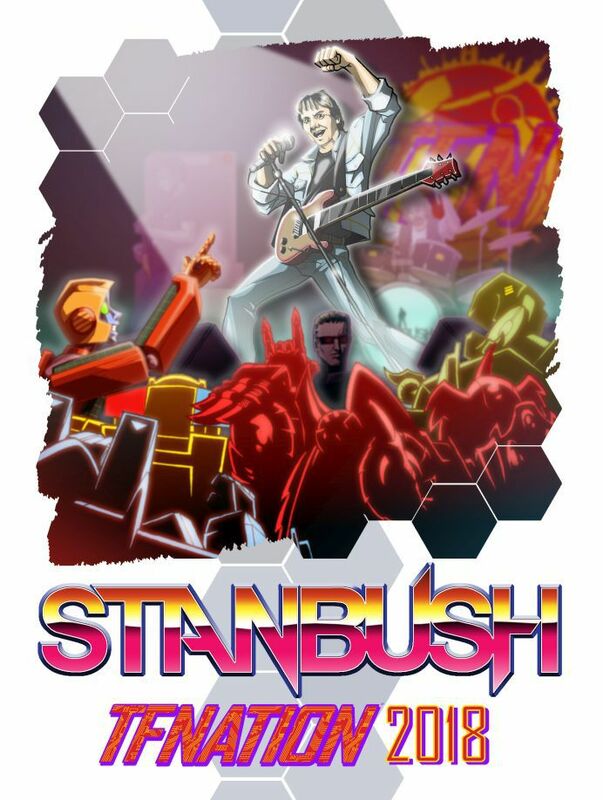 Preorders are open now and just £6 will ensure you get a copy. 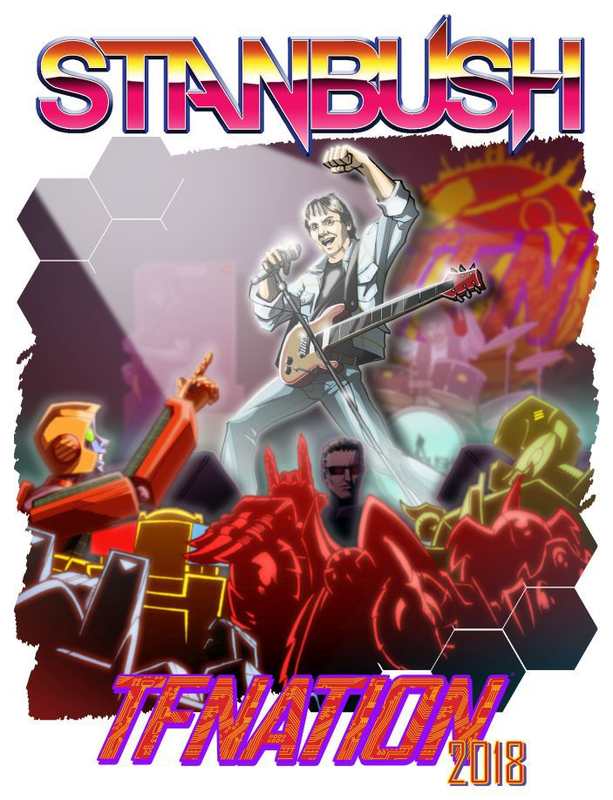 We will have a limited number of copies available to buy over the convention weekend, but the only way to guarantee you get your copy is to preorder. Now as with last year's Trial and Error book the proceeds from sales of the book will be going to Mary's Meals, a charity the TFNation community has long supported, so you'll be getting a fun read and doing your bit for a worthy cause. Light your darkest hour with the TFNation 2018 "G2" Bear only available at TFNation 2018. *Image is a digital mock-up, final product may vary. * All sizes mentioned are approximate. Our supplier uses modern cuts which are quite fitted - so if you prefer your t-shirts baggy, we would advise choosing a slightly larger size. If in doubt, please contact us before placing your order. As you will see, not all panels have been confirmed, so be sure to keep an eye on TFNation.com and all official and affiliated social media for constant updates. 12:00 PM - Double Dare, as we invite you to sit through what was one of the worst (but humorous) official dubs in Transformers cartoon history. 5:00 PM - The Toys and Traders panel grants a voice to some of the traders in attendance at TFNation. Hear the ups, downs and challenges these much loved/hated individuals go through to bring us all our beloved figures. 7:30 PM The Golden Age - Movie night is reborn with this fan favourite three-part episode. Hey, Does anyone know how much parking is at TFn? Artist Mike Collins, responsible for some of the earliest Transformers fiction to grace the UK, is the next guest for TFNation 2018! Just pre ordered the exclusive book that homages the old Ladybird series. I still have them all bar the Movie. Didn't think I'd make the convention this year but I just booked everything today. I can't wait for it now. Looking forward to catching up with friends I've made at previous conventions. A mate has just had to cancel his Saturday night Hilton room at TF Nation, so there may now be a room available at the convention rate should anyone require it! Free if you're staying at the hotel. Otherwise... uh. Website says £12, but doesn't specify if that's all day or not... I assume it is. Does anyone happen to have some spare Reprolabels faction stickers? still Pissed at my Brother that we won't make it this year. Finally. An update that isn’t a random bump. This will be my first time there, looking forward to it! A quick heads up that the trains from London to Birmingham this weekend are severely messed up. Euston station is going to be completely shut, so no trains will be running in or out of there either Saturday or Sunday (travelling up on Friday will be fine). Your best bet is to go from Marylebone, go up to Birmingham New Street, and then change for a train that stops at Birmingham International.